Elton John will be dressed exclusively by Gucci for his ‘Farewell Yellow Brick Road’ tour. 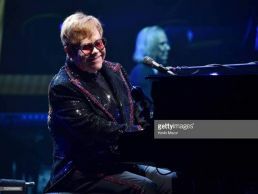 In Allentown, Pennsylvania, Elton John kicked off his final tour entitled ‘Farewell Yellow Brick Road’, which will span multiple continents including North America and Europe over three years with more than 300 dates scheduled. Elton will wear a custom Gucci wardrobe designed by Gucci’s Creative Director Alessandro Michele. 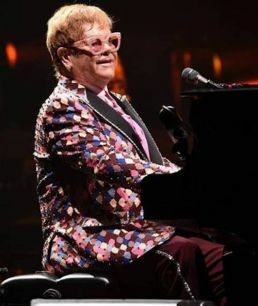 Elton John wore a custom Gucci all over black sequin one button peak lapel jacket with red and blue Web stripe sequin detail, black crystal and sequins frogging with sequins and dragon embroidery on the back and black trousers with a red and blue Web stripe sequin border to open his ‘Farewell Yellow Brick Road’ tour at PPL Center in Pennsylvania. He completed his look with light pink cat eye sunglasses with stars. 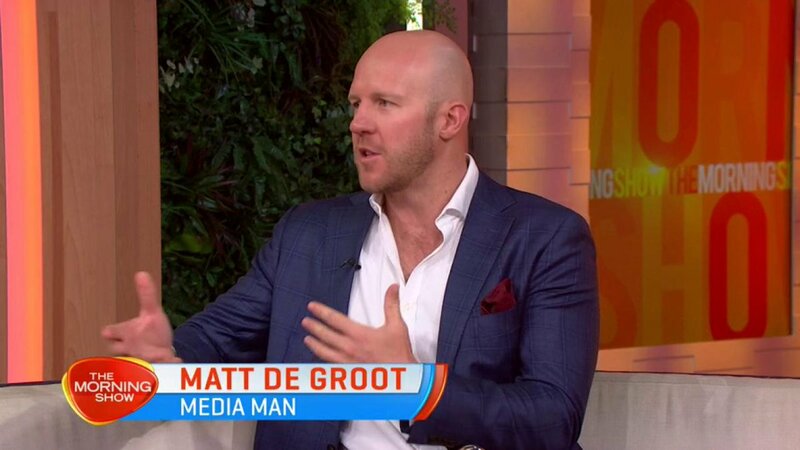 For his first wardrobe change he wore a custom Gucci all over harlequin printed one button peak lapel jacket with a black contrast grosgrain oversized lapel, stud and crystal appliqué and crystal trim border, burgundy trousers with crystal trim details and a pink silk self-tie blouse. He completed his look with burgundy patent leather lace-ups with crystal ‘E’ and ‘J’ on the toe, crystal lightning bolt details and red and blue Web strip and heart frame sunglasses. 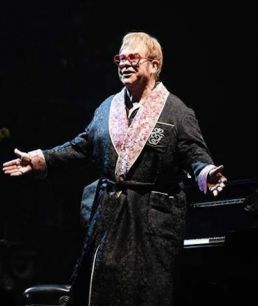 To close the show he wore a custom Gucci black and red floral silk jacquard dressing gown with a pearl and crystal embroidered Egyptian cat’s head on the back and pearl ‘E J’ monogram over a black tracksuit with red sleeves and red and green Web stripe details with ‘ELTON JOHN’ sequin embroidery on the back. He completed his look with heart frame sunglasses.